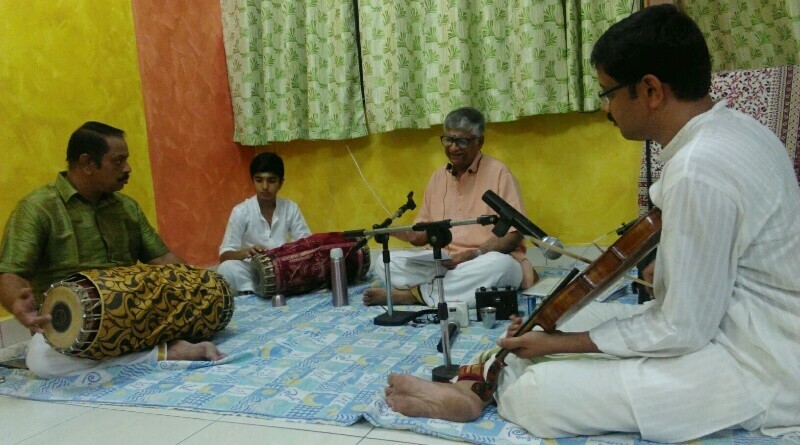 Picture caption: (Left to right) Rajasekar, Aditya, Venkateswaran and Vijayaganesh at the chamber music session in Brickfields, Kuala Lumpur. A rare opportunity to listen to Bhava Sangeetam (expressive devotional music) in Malaysia is not to be missed. The chance to relish the nuances of Carnatic music came over three consecutive days recently by grace of international concert singer, Professor S. Venkateswaran. Malaysia born Venkateswaran, 62, was initially trained by his mother, Srimati Sulochana Somasundaram before receiving the invaluable tutelage of several prominent music maestros of India while pursuing his tertiary education there. His music moulded by the likes of Sangita Kalanidhi Alathur Srinivasa Iyer, Sangita Kalanidhi Prof. Dr. S. Ramanathan, Violin Maestro Kunnakudi Vaidyanathan and Violin Vidwan Thinniam S. Krishnamurthy is rarely heard in Malaysia for lack of a proper venue and receptive audience. The professor jokingly pointed out that this team together with kanjira player Prof. Vellore Dr A.R. Srinivasan, who was not present, were referred to as the Chennai Music Mafia in the Indian music circuit having performed together for several years. It is notable that the quartet are not full-time musicians. While having professional careers of their own, their strong love and dedication for their art keeps them equally active in the concert circuit. The day after the Indian musicians arrival, a chamber music performance was organised at the home of Rajasekar’s Malaysian disciple, 13-year-old Aditya Rajkumar’s parents, in Brickfields. It was the first time the Chennai Music Mafia was performing in Malaysia and the small group of music lovers gathered were captivated right from the opening number. The concert started with a varnam in the raga Sankarabaranam. Prof. Venkateswaran succinctly enunciated the swaras in the raga alapana – tracing the path of River Ganges sprouting out from the bund of hair on top of Lord Siva’s head and cascading down His sinewy matted locks – describing the swarupa (character) of the raga associated with the Lord of Dance..
Vijayaganesh, a prime disciple of Shri. A.G.A. Gnanasundaram in the revered violin school of Padmabhushan Lalgudi Shri Jayaraman embelished the raga with his masterful bowing. Having played regularly for Venkateswaran, Vijayaganesh’s violin response perfectly echoed the divine singing. The creative flow of rhythm kept the krithi afloat and flowing with the light and measured drumming of the mridangam by Rajasekhar. The mridangam maestro learnt his art from the late Shri T. R. Harihara Sharma and later with Vidvan Shri T. H. Vinayakaram. He also had training under Vidvan T. V Gopalakrishnan. Rajasekar was ably assisted by Aditya, who was gently being eased onto the public stage. The other compositions presented during the evening were Muthuswamy Dikshithar’s Maha Ganapahim in Natai raga, Eka tala; Thyagaraja’s Sujana Jeevana (Khamas, Khanda chapu), Marukelara (Jayathasri, Adi) and Telisi Rama (Poornachandrika, Adi); Papanasam Sivan’s Neekurugi (Abogi, Adi); Syama Sastri’s Sankari Sankuru (Saveri, Adi (Thisra Nadai)); Saradha Easwaran’s Santhamayam (Neelambari, Khanda Chapu) and Ragam Tanam Pallavi (Suddha Saveri & Dharmavathi). The Ragam-Thanam-Pallavi item composed by Prof. Venkateswaran was a surprise gift for Aditya’s mother, Jayalakshmy who is also the professor’s disciple. The ragas chosen for the composition, Sudha Saveri and Dharmavathi are derived from Sudha, as she is fondly called at home. The Pallavi, enunciates her full name: Jayalakshmy Rajakumari, Janaka Putri Manohari. The Pallavi illustrates the Puranic account of the descent of goddess Lakshmy from Vaikunta as a baby girl uncovered by King Janaka in the earth as he ploughs a field under Divine instruction. The infant named Sita grows into a great beauty who reunites with her Lord and returns to their Divine Abode. The music concert lasted three hours. All those who attended it carried away fond memories of their encounter with the Chennai Music Mafia. The next day Prof. Venkateswaran and his ensemble headed north to perform at Sapthaswara Sangeethalaya Academy of Fine Arts in Ipoh, Perak. This was followed by a concert at the Brahmana Samajam, Malaysia in Kampung Kasipillay Kuala Lumpur. Prof. Venkateswaran gave performances in Australia and New Zealand immediately after his Malaysian concerts and closed 2017 with performances in Chennai and Bangalore. Review by R. Sittamparam and Rajkumar Sahasranam.